Technical Car Experts Answers everything you need: 1999 Cadillac ELC System working procedure. The Electronic Level Control (ELC) system adjusts rear trim height in response to changes in vehicle loading. This system consists of an air compressor assembly, air dryer, exhaust solenoid, compressor relay, height sensor, air adjustable shocks and air tubing. The compressor is activated when the ignition is On and weight is added to the vehicle. The exhaust solenoid is connected directly to the positive side of the battery, allowing the system to exhaust when the ignition is Off and excess weight is removed. When a load is added to the vehicle, the body is moved down causing the height sensor arm to rotate upward. This movement activates the internal timing circuit which, after a predetermined delay of 8-15 seconds, grounds pin No. 3, thus completing the compressor relay circuit to ground. 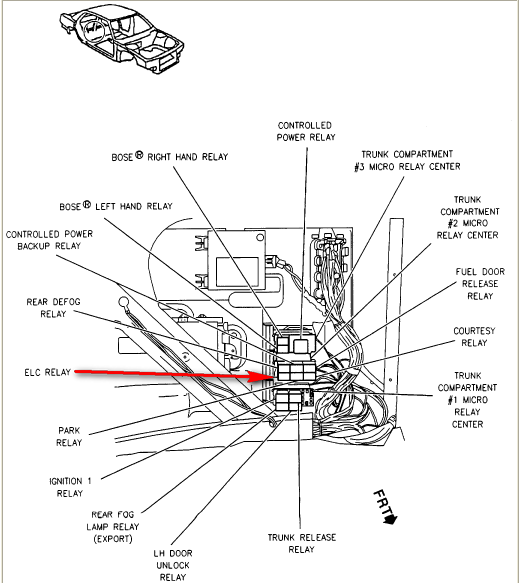 When the relay circuit is energized, the circuit to the compressor is complete, allowing the compressor to send pressurized air to the shocks. As the shocks inflate, the vehicle body moves upward, causing the sensor arm to rotate downward. Once the body reaches its original height, the sensor opens the compressor relay circuit and shuts the compressor Off. When excess load is removed from the rear of the vehicle, the body rises upward; this causes the sensor arm to rotate downward. This movement activates the internal timing circuit which, after a predetermined delay of 8-15 seconds, allows the sensor to complete the exhaust solenoid circuit to ground. With the solenoid energized, air exhausts from the shocks back through the air dryer and exhaust solenoid valve. As the vehicle body lowers, the height sensor arm is rotated upward until the vehicle reaches its original height. When this height is reached, the sensor opens the exhaust solenoid circuit which prevents air from escaping. The height sensor position is checked when the ignition is turned On. If the height sensor indicates that it is not necessary to raise or lower the vehicle, the internal timer circuit is activated. After 40 seconds, the compressor will run for four seconds. This ensures the shocks are filled with the proper residual pressure (7-14 psi). If weight is added or removed from the vehicle during this 40 second delay, the air replenishment cycle will be overridden and the vehicle will raise or lower after normal delay. If the vehicle is staying at the maximum height without the compressor running, you have a bad ELC Height Sensor. If the compressor is running, then you have a bad relay or a short to ground. The ELC Height Sensor is located on the left rear lower control arm. The Exhaust solenoid is located inside the compressor assembly and also acts as a safety valve to prevent too much pressure from building up. If you continue to have rear suspension that is jacked up and a leveling message then there is indeed a problem with the automatic leveling system. What you can look for is in the left rear where the rear suspension connects to the frame there is a leveling sensor. If the sensor becomes disconnected, you'll have this type of problem. "Electronic level control system may not work properly"
This results in the rear air lifts providing either too much or too little air flow. Also there may be leaks in the air suspension system, which causes the compressor to run continuously and then burn up. Most likely the cause is a leak in one of the lines. Wipe them down with soapy water and look for bubbles. Caddy dealers sell a splice kit to do the repair.